"... Many tracks seems derived from local folk music. Is there any official word about it??" Search youtube for 'Sound Trippin', you'll get a fair idea. 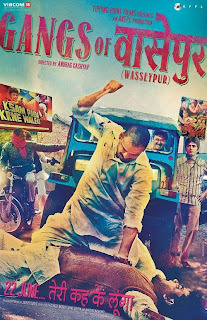 The language used in the soundtrack is Bhojpuri, a dialect of hindi. There is NO LANGUAGE named BIHARI in Bihar or Jharkhand (where the film is based). Bhojpuri, Maithli, etc are dialects of Hindi spoke in UP and Bihar.All of them use the exact same Devnagiri script and are differentiated from each other by nuances of pronunciation, grammar and complex caste structures that prescribe to them. Absolutely fabulous music. Will definitely leave a lasting memory!!! You call this a review?? ?